It's been exactly a 5 weeks since I published my last weekly digest. This also makes it the longest absence I've had on the blog since I started it. I could go on and give you a handful of excuses, but I won't. It just was a tough month personally and professionally and I really didn't have the time to sit down and put my links in order. Or the desire. But I missed it. Turns out this process of carefully going through my bookmarks and newsletters and curating the most interesting parts of it all was something that brings a lot of joy. So I promised myself to avoid such long radio silences. Now on to todays goodness. Naturally, more than the usual 6. I hope you find something to make you smile! 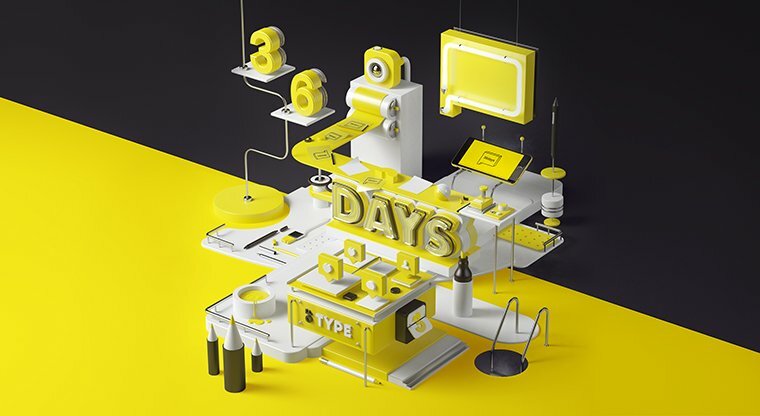 36 Days of Type is a project that invites Designers, Illustrators and Graphic Artists to express their particular view on letters and numbers of our alphabet. Their Instagram feed makes it a perfect inspiration dose for the start of your day. Random photos turned into movie posters - yes! Managers maximize the bottom line, leaders maximize the potential of their staff: Lessons in leadership from a 92-year old product designer. Memberful is a secure and reliable membership software service. Sent the artwork to a client and they never paid? fileship solves that problem. I'm not a big Heineken fan, but this ad is pretty smart. What is love (baby don't hurt me). The taxonomy of typography. #wishlisted. Exceptional newsletters about creative obsessions. Vocus allows you to take your Gmail game to the next level! Being into the email debt game myself, I am definitely going to give it a try. Creative co-working spaces for staying productive anywhere. Big businesses want, need, and will pay for design - this, and a lot more design trends in the 2nd Annual Design in Tech Report by John Maeda. Read this if you're lazy, or go through his slides if you're of the curious type. Learn to live with what is necessary and fairest. Note to self - watch the whole Human movie. In case you were wondering how I feel after a kickass workout, there! Front and featured image via. Header image via. "todays" should have an apostrophe. Love the post though!